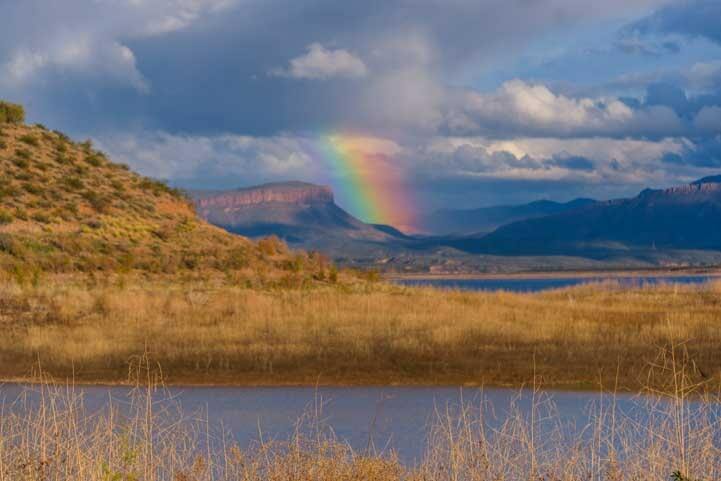 Rainbows and Wild Horses in the Arizona Desert! 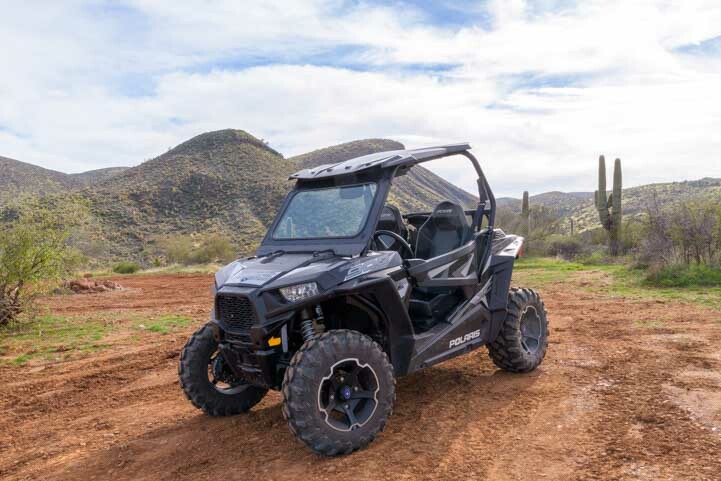 February 2019 – For us, 2019 started out with a zoom when we bought a new-to-us Polaris RZR 900. But we set it aside for ten days so we we could do a quickie National Parks Snowstorm Tour to see Grand Canyon and Bryce Canyon decked out in snow. 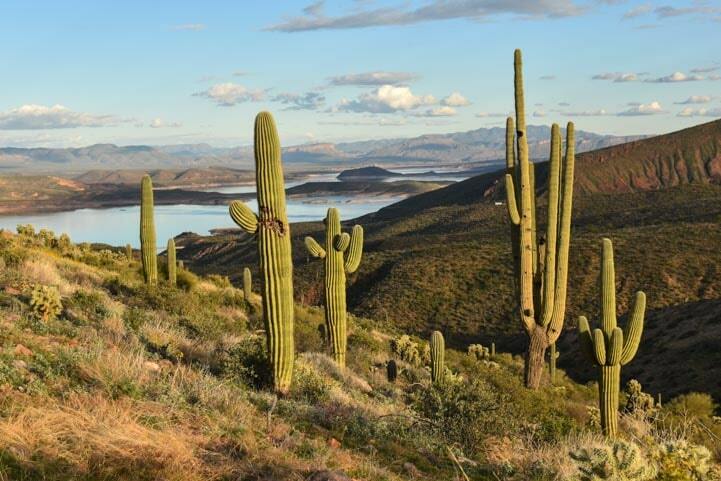 When we returned to Arizona’s Sonoran Desert and began to thaw out again, we were ready to ride. Two very happy campers ready for some adventure. Our campsite looks a bit different now with our new addition! We had decided to triple tow the RZR on a small 5′ x 10′ utility trailer behind our fifth wheel trailer, and we were very uncertain how this arrangement would work out. So, we were absolutely thrilled when we did our first 125 mile trip across the north edge of Phoenix, including a stop at an RV dump station in a fairly tight gas station, and found it went really smoothly! 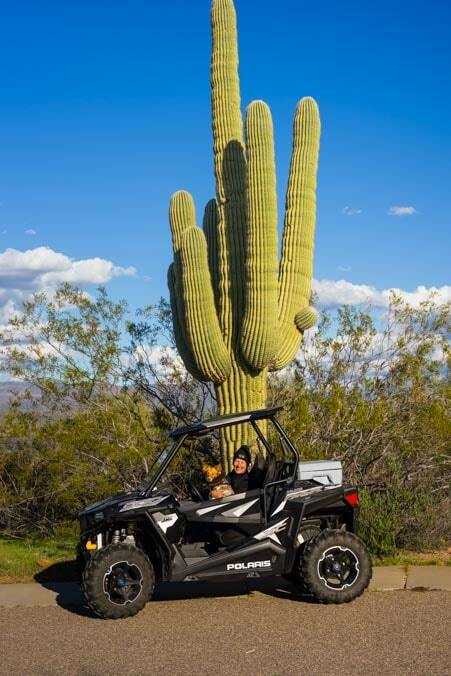 The little RZR is our ticket to new thrills! Our biggest concern had been how this train of truck + 5th wheel trailer + utility trailer would handle in tight spaces. We do a lot more U-turns in our traveling lifestyle than we’d care to admit, and being able to reverse direction without becoming a bull in a china shop is important! It turns out that because the utility trailer is really narrow — five feet wide as compared to the fifth wheel’s eight foot width — its wheels take a wider turning arc than those on the fifth wheel. What a surprise! When we were maneuvering in the tight spaces of the gas station to get to the RV dump on the side, we inadvertently rolled the fifth wheel’s tires over a curb. We expected to feel a second thump-bump of the utility trailer’s wheels going over the curb too, but when we watched the trailer behind us, it scooted smartly around the corner and stayed in the road the whole time with a few inches to spare. Mark loves old windmills so we always stop to get pics of them! 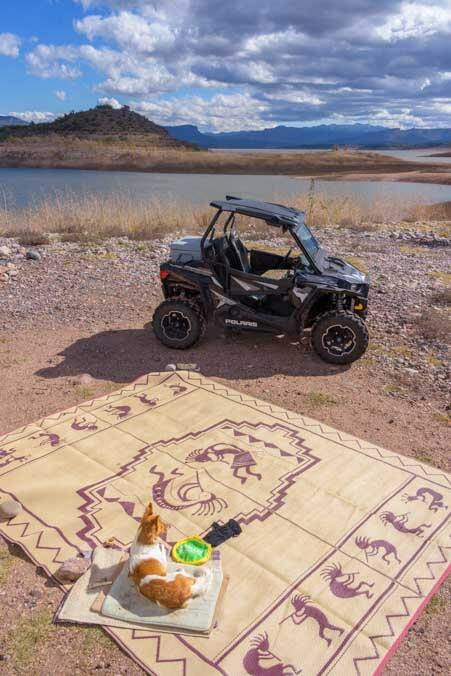 Once we got our train detached and set up in a campsite, we started taking the RZR out on excursions. What a blast that little buggy is! 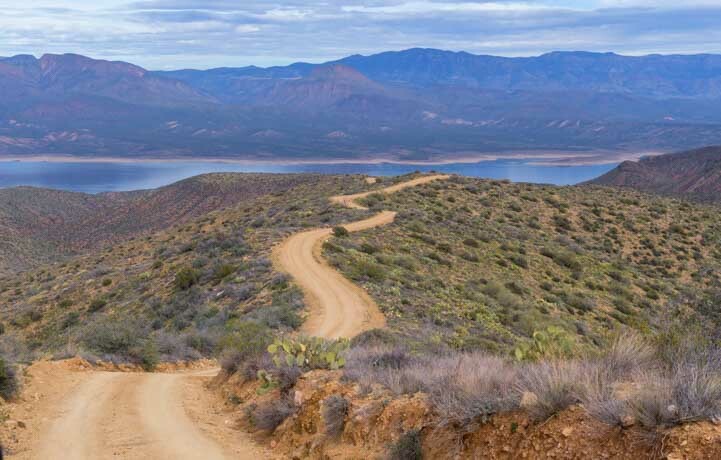 We have camped at Roosevelt Lake many times over the years, and have always wondered what lay in the distant mountains and valleys around the lake. Now we could get on the trails and find out. 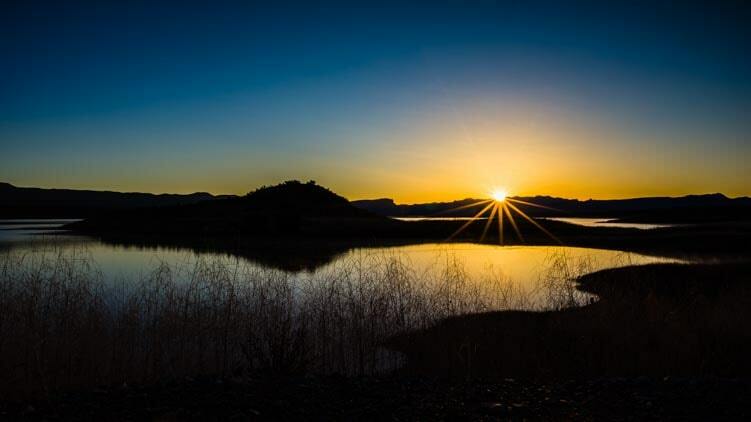 Where the desert meets the water at Roosevelt Lake. 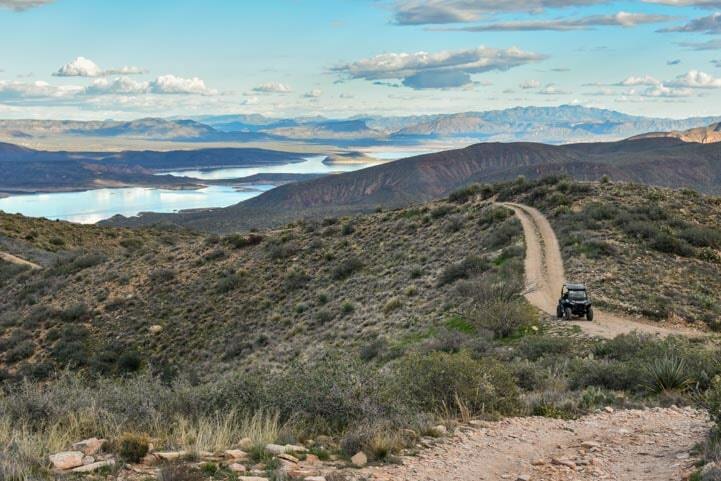 There are quite a few dirt roads and 4×4 trails that head off into the hills, and we explored a lot of them. Some we could have driven in the truck, and some we could have mountain biked, but most would have been impossible for either our truck or bikes. 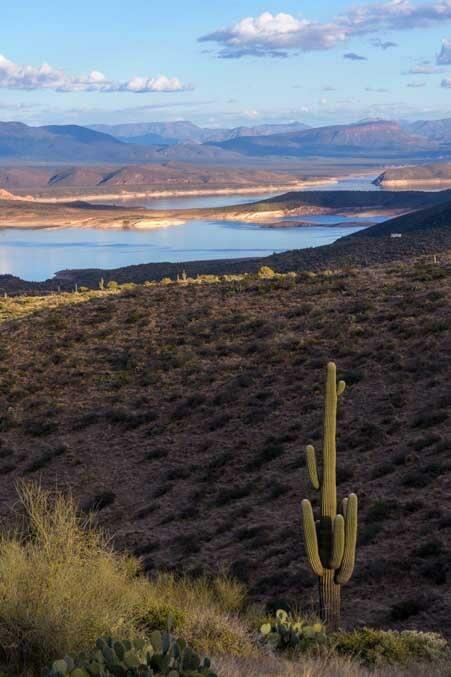 Late afternoon glow on the saguaro cacti high above the lake. After a little off-road riding it’s nice to stretch the ol’ legs on a hike! Cactus and red rocks. What a combo! It was satisfying to go down roads we couldn’t have accessed without the RZR. That is why we bought it, after all! In a few places we came to trailheads. 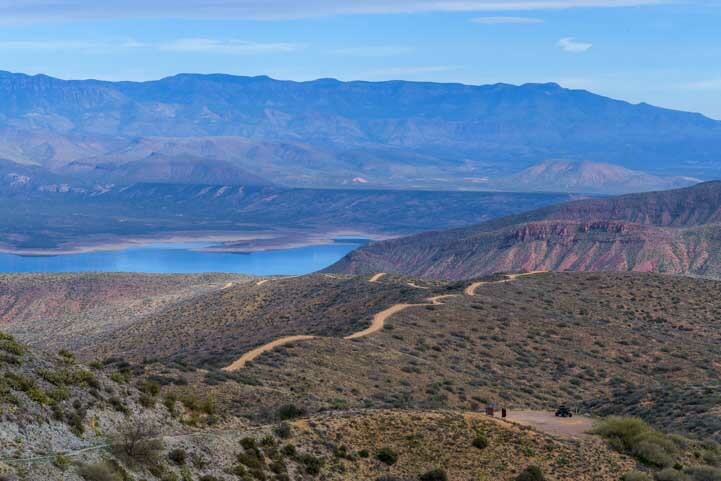 Some were sections of the cross-state Arizona Trail. It was neat to be able to hop out of the RZR and go do a couple miles of hiking without seeing a soul around. 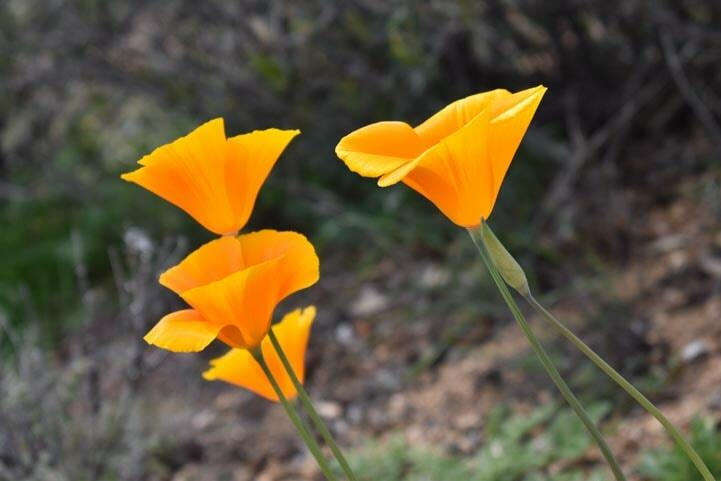 Even though it was late January to early February, some of the higher elevation hillsides were covered with desert poppies. We also saw a few lupine blooming here and there! I don’t quite understand why the desert poppies would bloom at high elevations in January and at lower elevations in March, but Nature has its mysteries. 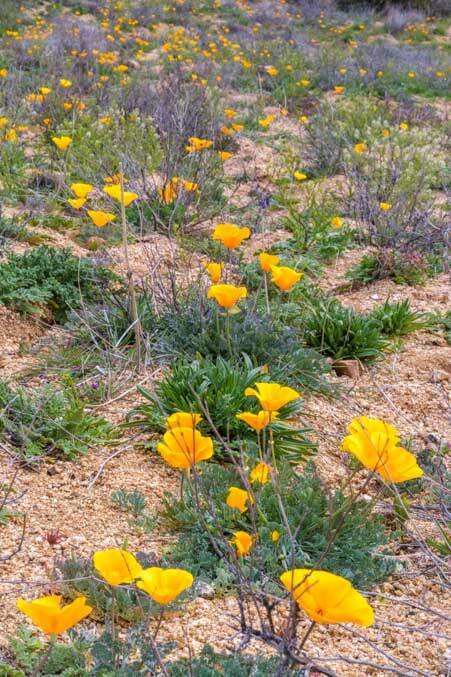 We were very surprised to find some higher elevation hillsides covered with desert poppies. 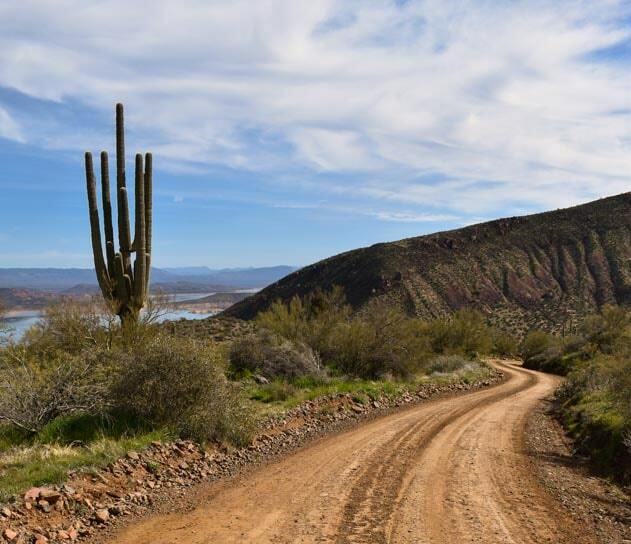 Some trails just petered out after a while, but one day we traveled deep into Tonto National Forest on a series of trails that seemed to go on forever. We passed a homestead and crossed quite a few cattle boundaries, opening cattle gates to let ourselves through and closing them behind us as instructed by signs on the gates. In a few spots we saw cows and calves. We weren’t too excited about them, but Buddy perked right up and watched them closely. At one point we looked up on a berm and there was a wild horse staring at us. Buddy dashed up the berm to touch noses with it and then he bolted back down again. 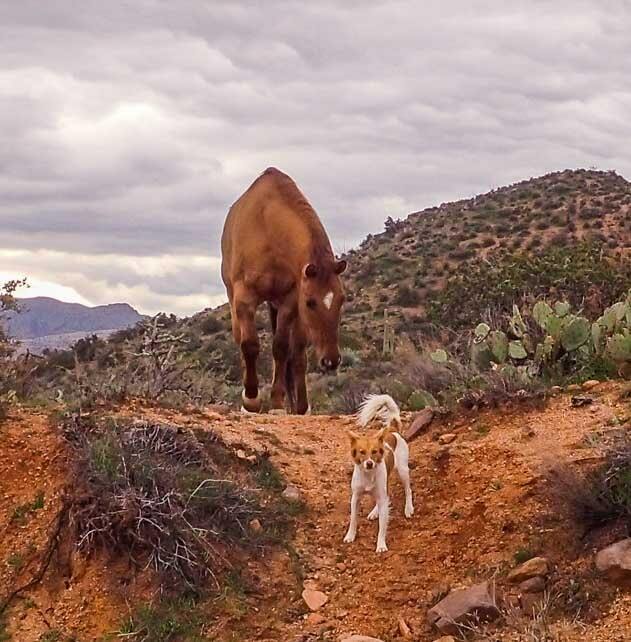 Buddy ran back down the hill after saying hello to the wild horse. 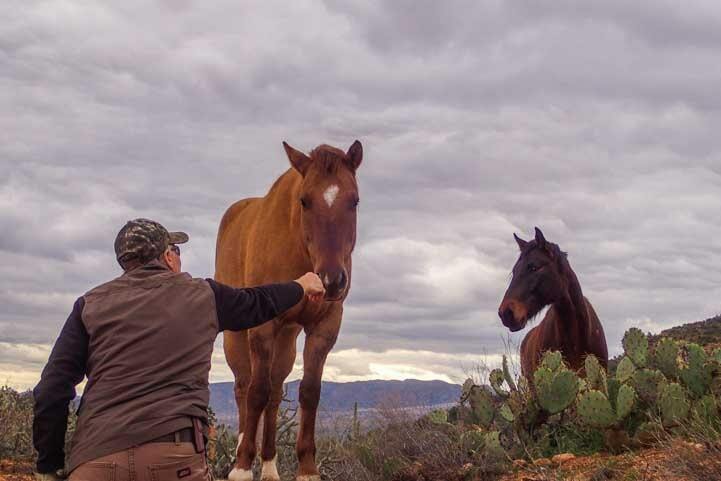 These horses were definitely the wild kind we’ve seen along the Salt River before, but they were very tame and seemed as curious about us as we were about them. These horses were extremely curious about us. 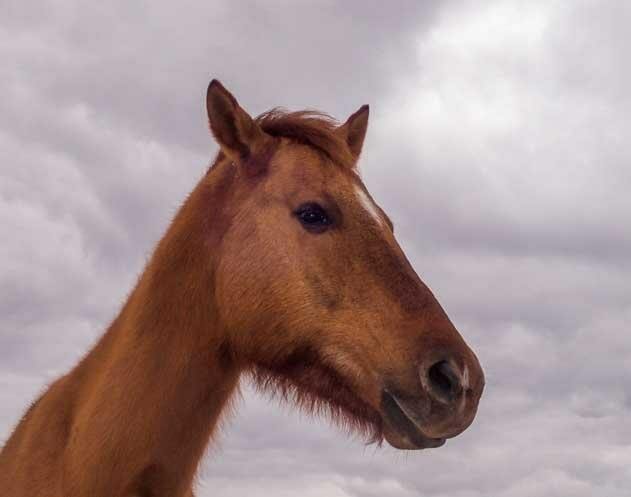 They had the familiar fuzzy faces that the wild horses of this area have, and they had no shoes on their feet. Their unusual calmness in our presence made us wonder if someone had been feeding them or working with them in some way. Their manes and tails weren’t covered with burrs the way many wild horses are, and they seemed to be well fed, no doubt due to the lush green grasses covering all the hillsides! 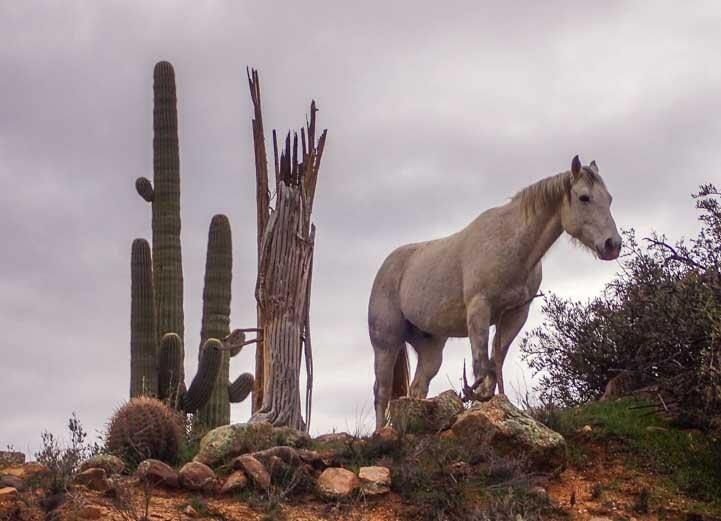 Classic — A wild horse standing between a saguaro cactus and an old cactus skeleton. 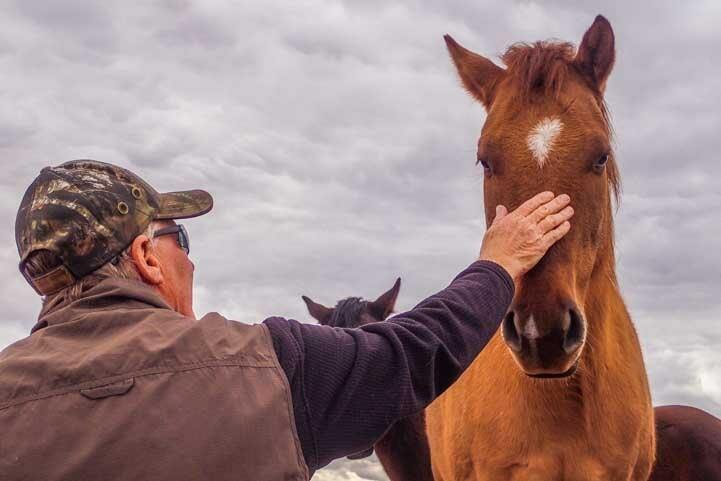 How cool to head into the National Forest and come across these special horses! We had a blast every time we went out for a ride. It seems that this RZR thing is going to be a lot of fun! The funny thing, though, is that sometimes the most dramatic and beautiful things in life are those things that come to you on their own rather than you hunting them down in a RZR! One day we went to the nearby town of Globe to do laundry and other errands. We decided not to pack our cameras because, well, what is there to take photos of on errand day at the laundromat? Besides, it was pouring pitchforks and we knew we were in for an all-day rain. On our way back we noticed the sun peaking out of the clouds once in a while. Then suddenly we saw the most enormous rainbow crossing the entire hilly desert landscape alongside the truck. OMG! Why didn’t we have our cameras? It was a 30 mile drive to get back to the campground, and the rainbow followed us the entire way, its little pot of gold moving across the desert right below it just as fast as we were driving. At times there was a double rainbow! 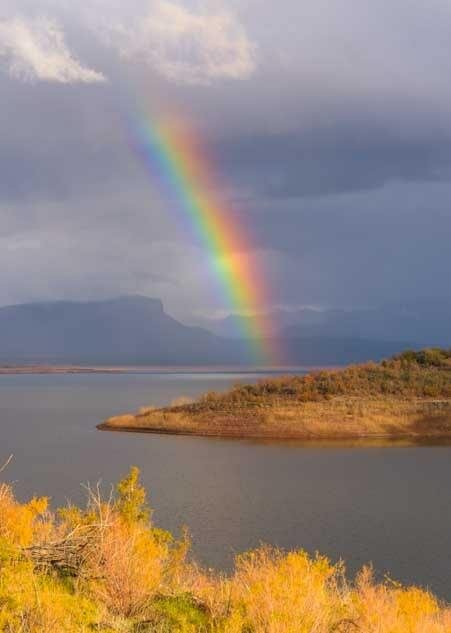 We couldn’t believe we were seeing this stunning spectacle with no way to photograph it, but we resigned ourselves to just enjoying the rainbow out the window and imagining the photos we would have taken in this spot and in that spot. The shock, though, was that the rainbow was visible and with us for the entire 30 mile drive until we pulled into the campground. Unfortunately, by the time we got back to our campsite, the rainbow was gone. We began unloading the truck, excited but dejected that we had missed this incredible rainbow photo-op. Suddenly, as we made yet another trip out to the truck to bring in more stuff, we looked up and saw the rainblow forming in the distance. We both dove for our cameras and began snapping like mad. The rainbow’s colors intensified until we were both exclaiming that we had never seen a rainbow so bright! The colors were so vivid that they reflected across the water even though the surface of the lake was slightly ruffled by a soft breeze. We ran along the shoreline trying to find the best vantage point, and the rainbow just kept on glowing. We were astonished and elated. That night the rain came down in buckets on our trailer. We woke the next morning to black clouds and more rain. No problem. Mark baked banana bread and life was good and toasty warm. Late that afternoon the skies cleared and the sun came out for a little while. And then we had a repeat of the day before as a rainbow formed in the distance. A rainbow peeks out from beneath the storm clouds in the distance. The sun played hide-and-seek with the clouds, and the land brightened and darkened as the clouds frothed overhead. The sun lit the foreground for a moment. A dark shadow formed in the sky but the rainbow was still visible underneath. How wonderful! 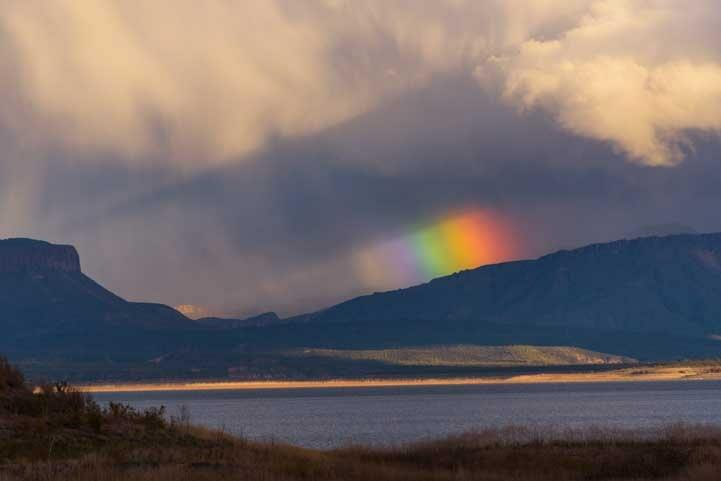 A distinct shadow appeared in the sky above the rainbow. What a thrill this was, and what a great surprise. The days of rain eventually stopped, and although that was the end of the rainbows, the churning skies gave us some fabulous clouds that produced brilliant sunsets over the next few days. Then one morning the sky was perfectly clear as the sun crested the horizon, and with that the celestial show was over for a while. We never know what to expect when we get up each day. 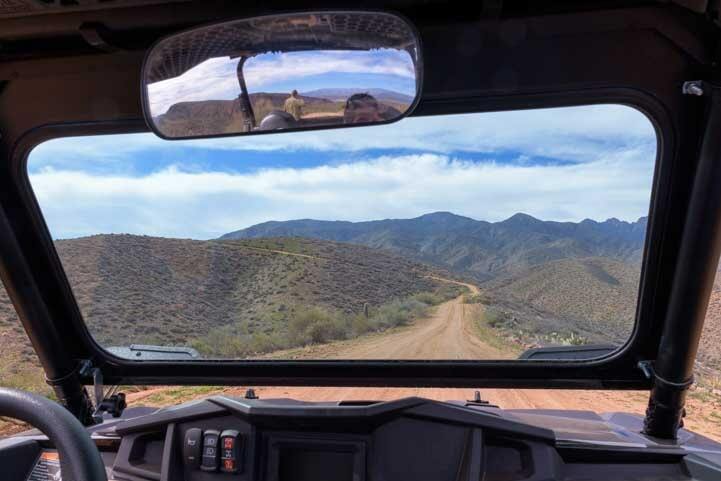 Sometimes we go looking for adventure — and the RZR is proving to be a great way to get there — but sometimes the adventure finds us! 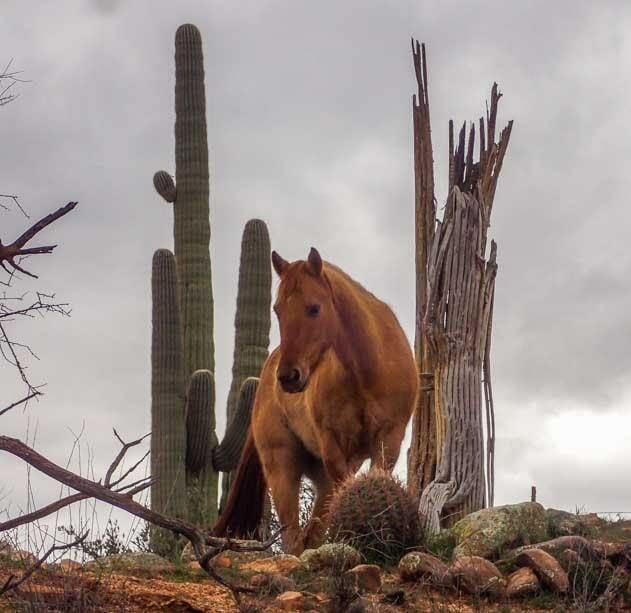 This entry was posted in Arizona and tagged Arizona, Arizona Central, Arizona Phoenix East, New, Travel, USA, Wild Horses, WP Travel by Roads Less Traveled. Bookmark the permalink. Wow! Thank you, Jeff. Now you’ve set our day up to be especially beautiful! We are fortunate to be out here doing what we’re doing, and it means the world to know you appreciate what we share. Enjoy your weekend, and thanks again! Magical post! I so enjoy following your blog. These were magical moments, Janie. Nature at her finest! Thank you for coming along on the ride. WOW, your pictures were spectacular. 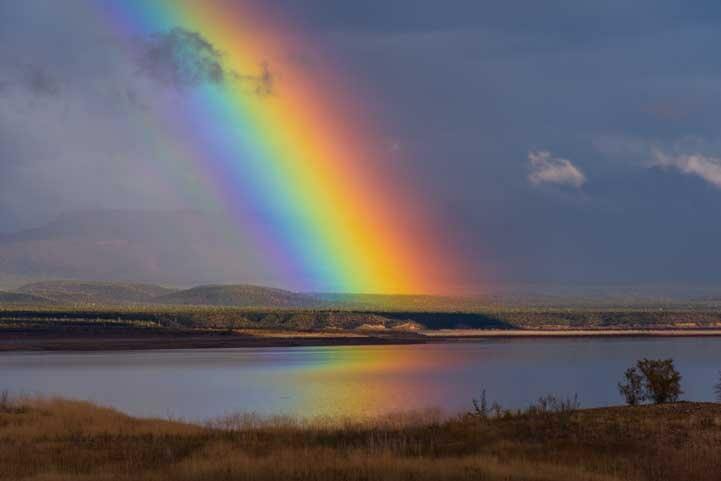 I have never seen such gorgeous rainbow pictures. 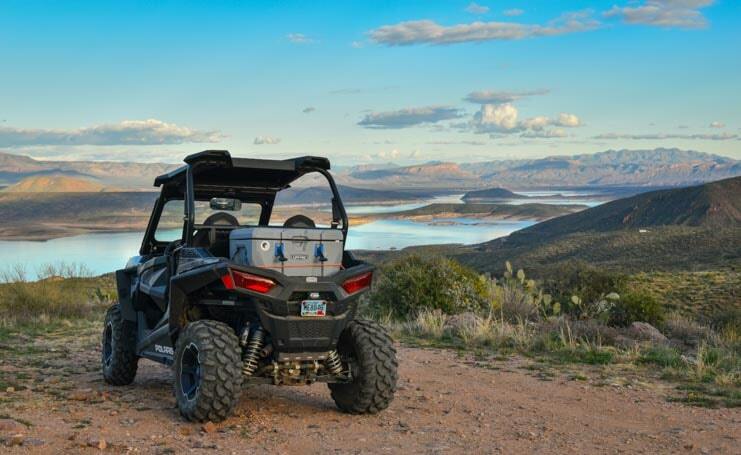 We are in the process of moving from CA to Prescott, AZ and now after your beautiful pics are even more excited to get our ATV and explore. Arizona is so beautiful. 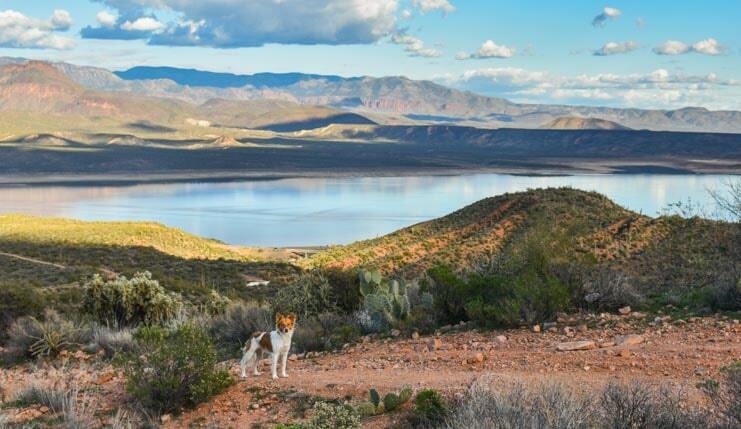 Have you ever experienced the Borrego Desert after a rainy winter. The flowers are beautiful. The little town of Borrego Springs is a fun little community and a great place to view the desert flowers. Should be in full bloom in a couple of weeks. There are also some really interesting large metal sculptures scattered through out the area. Hope you take a drive over and on the way you can go by the Salon Sea. Very interesting area, especially at this time of the year. Love your blog. Prescott is a great area in AZ and I’m sure you’ll love living there, Pat. 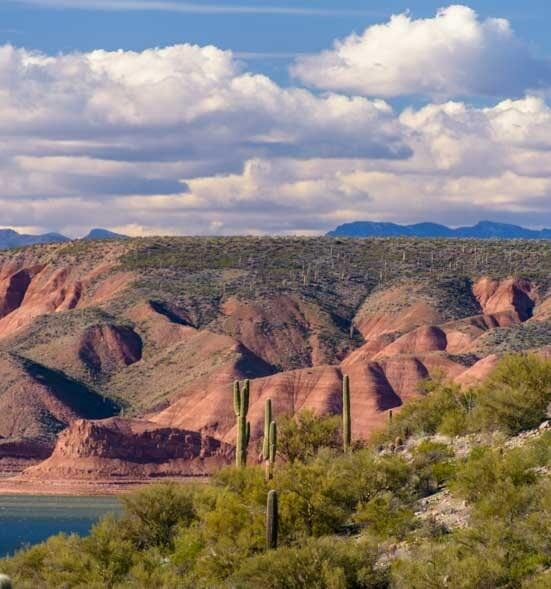 All of Arizona is beautiful and there is a ton of variety from one end of the state to the other. We have been to the Salton Sea and explored the shore a bit on our bikes. Very intriguing. We also zoomed through Borrego Springs once many years ago but didn’t stay, so it is still on our bucket list. 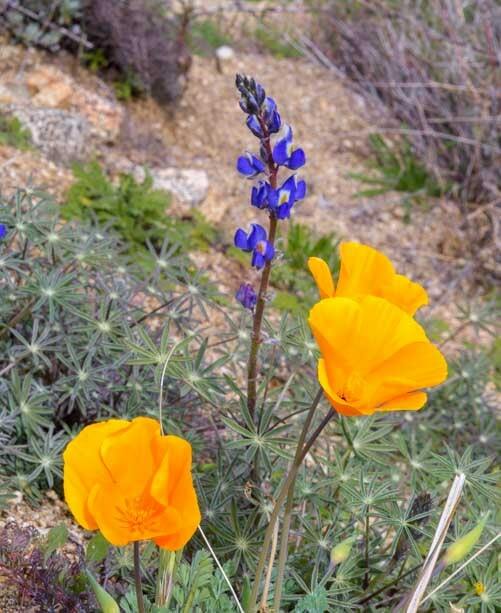 We heard that a few years ago the wildflowers were so plentiful in that part of California that astronauts said they were visible from space!! So, of course we have to get there someday soon. Thank you for reading and happy moving and travels!! Beautiful pictures, and a wonderful story, EM & M! 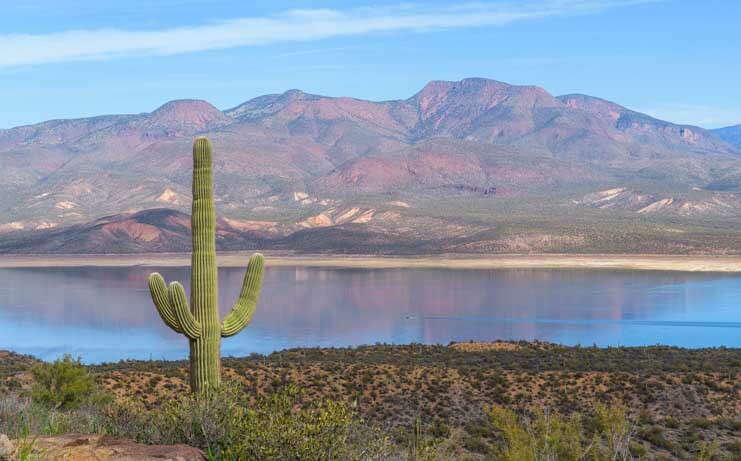 Yep, we haven’t commented in a while – just stuck to following your pictorial adventure blog; enjoying RV life through yourself and Mark’s words and pictures…..And this is why we call Aryzona home, too….especially for the Winter months….in lieu of the soggy Northwest. Which is great during the late Spring, Summer, and Fall. Congrads on your latest Escapee’s magazine cover photo, by the way…..
Will be curious about your upcoming experience with the Razor in tow; as we have wanted a UTM for a number of years but couldn’t figure out how to tow our 34 ft Montana – and a UTM/trailer. A toy hauler is not on our list; because of the poor quality of these rigs, very tight living space, and god-awful length of the overall trailer. Tis bad enough, just pulling the Montana, with a standard Duallie 0ne ton truck! Like the fact that the Razor/trailer, tracks well behind your l o n g rig. Maybe a back-up camera would be a good accessory, huh? Arizona is a beautiful state and you are lucky to live here, Bette & Glen. Enjoy! I was tickled to get that cover photo on Escapees Magazine, both at the moment I took the photo at sunrise and then again when Escapees accepted it for their cover! Toy haulers are interesting trailers since they are much beefier in their suspension than ordinary fivers of the same length but they offer such reduced living and storage area and are generally decorated like a flashy sports bar with lots of stuff we would never want or use. To say we are frustrated over our search for a replacement trailer is a vast understatement. If only the mid-priced non-mass market trailer manufacturers hadn’t been pushed out of the industry by the recession and subsequent corporate consolidations in Elkhart, Indiana. 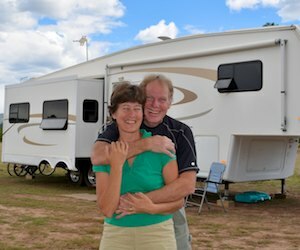 The state of the industry is not a happy one for RVers. That aside, so far so good with the triple-towing. Time will tell how we like it down the road. A backup camera is something we’re considering but we haven’t done too much research into it yet. Enjoy your pups and your travels in your Montana, and thank you for following our adventures for all these years! What stunning pictures! Fascinating rainbow shots. 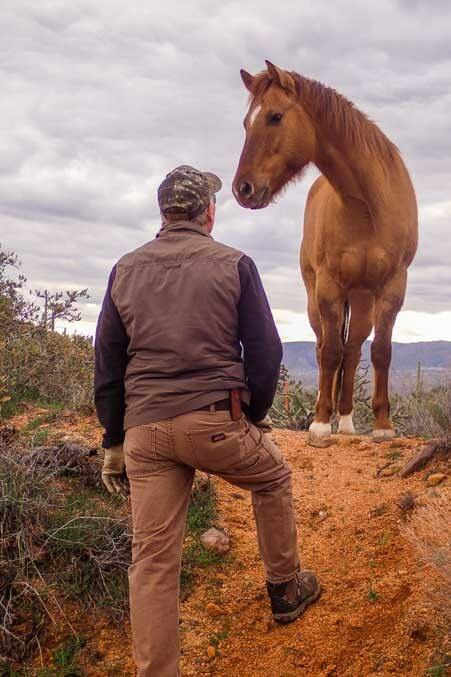 And who knew that Mark and Buddy were “Horse Whisperers?” I certainly had no idea. 🙂 Of course, what everyone wants to know is why you two would ever head out without your cameras? Ever? From now on, you need to adhere to the 11th Commandment: Thou shall not leave thy cameras behind. So true, Bob. We’ve been caught cameraless too many times, but don’t seem to learn the lesson! It’s nothing to pop one or two in the back of the truck. On the other hand, some of our greatest experiences have come when we didn’t do that, so it makes us wonder if by leaving them behind we’re inviting awesome adventures to come our way. The 11th commandment is a great one we’ll try to adhere to, but Murphy wasn’t so far off with his law either!! 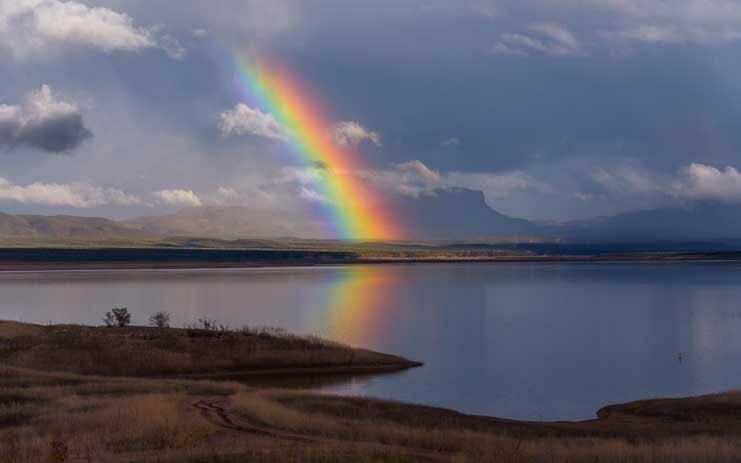 Wow, in all the times I have spent some winter camping there I had never seen such a beautiful reflected rainbow. It was an incredibly special moment, Jan. We’d never seen a rainbow like that before either and we were over the moon with excitement!! 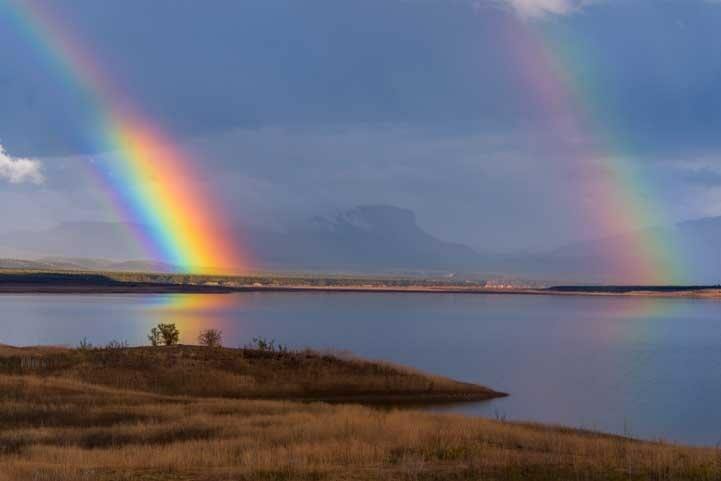 Beautiful rainbow pictures! What an incredible sight. 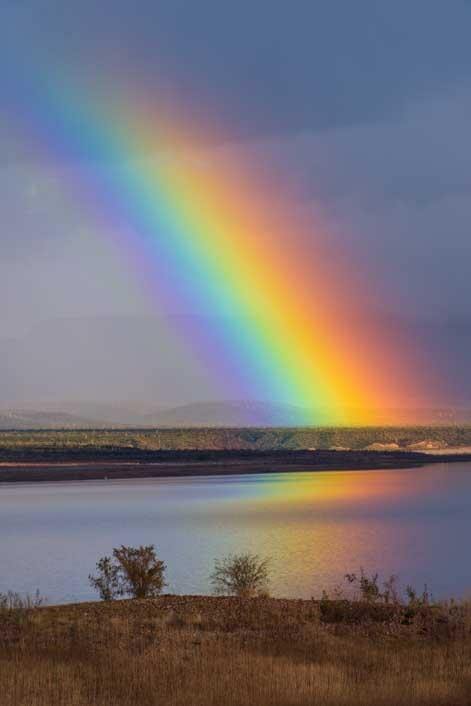 You just never know with rainbows – sometimes they disappear and sometimes they hang around. Nice catch. The new toy looks like it’s going to be A LOT of fun! Thank you, Edith!! Rainbows are so elusive. Funny thing with the rainbow on the second day was that I hiked around a point on the lake thinking I’d get a really cool shot from the far side, but when I got there the rainbow was gone. As soon as I hiked back to the campsite, I found out it was still there, glowing away. You just had to be at the right angle!! 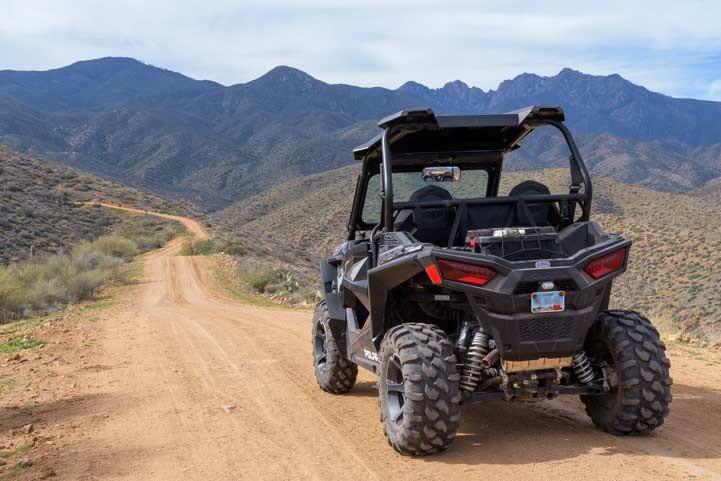 The RZR is super fun and is opening up lots of possibilities. Thanks for reading! You are taking Roads Less Traveled to a new level!! I can’t wait to see your pictures from the deeper wilderness!! 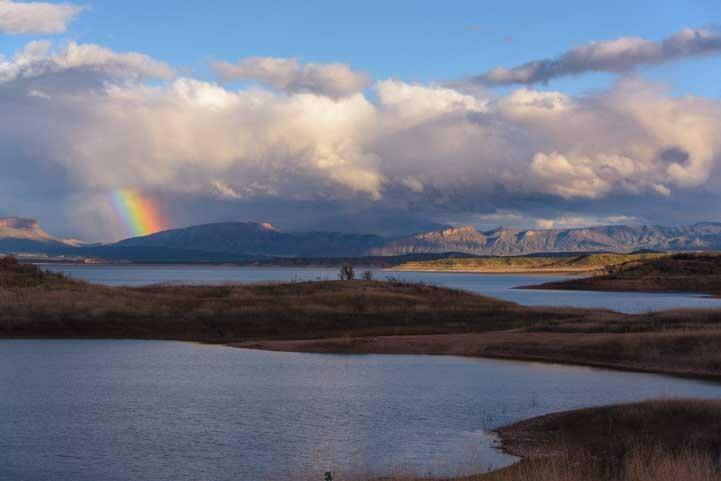 The rainbows are supernatural – I’ve never seen a rainbow’s reflection on water!! Beautiful photography for sure! Thank you for sharing!! We’re just mixing it up to keep things interesting and keep ourselves on our toes, Deborah. 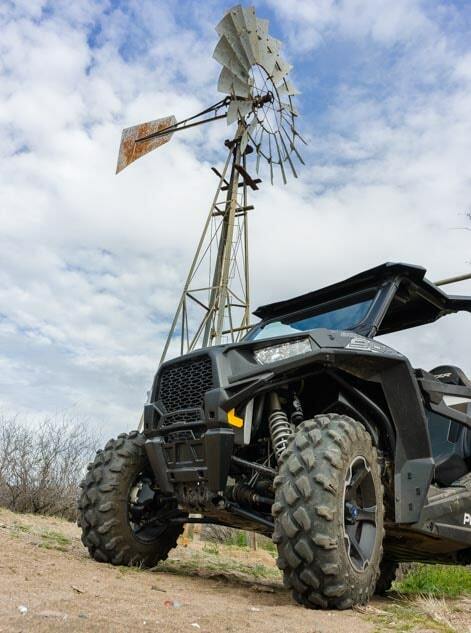 With the new perspective of a RZR and a pup we’re seeing lots of old familiar things in a whole new way. That reflecting rainbow was a gift from heaven, though, and we’re very grateful to have been at the right place at the right time to see it! 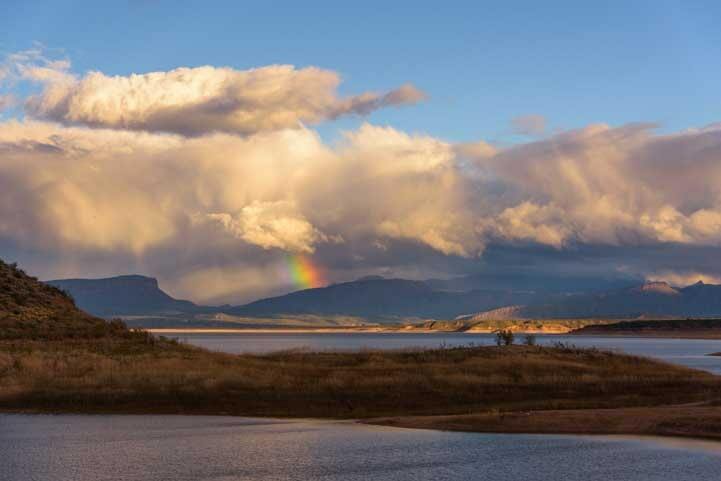 …peek-a-boo rainbows and fleecy-cloud stunners !!!! Just the right rain-to-sun weather a few days go for a rainbow in “Little Havana”…but I couldn’t find it ! I love it when there’s sun and dark clouds, but a lot of times it seems a rainbow ought to be out there somewhere and it isn’t. I think their unpredictability is part of their special mysteriousness and allure!! That rainbow (and a double rainbow) took us by surprise last week in Scottsdale also. Beautiful pictures, thanks for sharing. We went to the cabin (near Young) yesterday and were surprised to see a fair amount of snow on the ground. Hopefully Roosevelt water level will rise this year. How neat that the rainbow showed up in Scottsdale too, Liz! 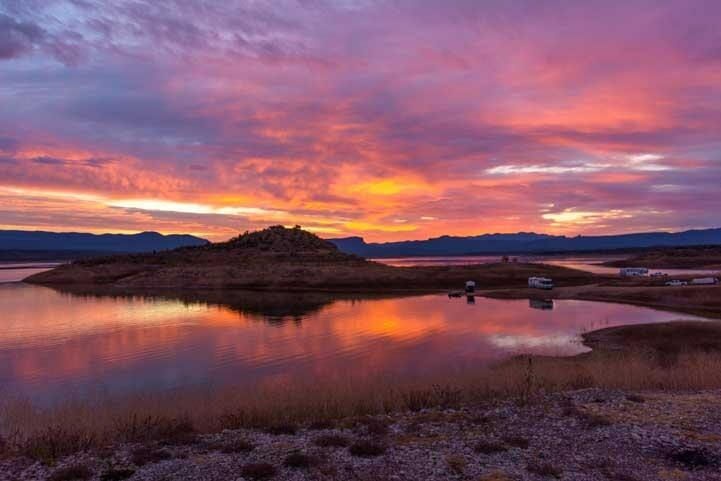 Roosevelt Lake is very low right now, but it is slowly rising. There’s been a ton of snow in some areas this year, so with any luck maybe the lake will fill up a bit! We’ve never been to Young… it’s on our list!!! You’re going to have a ball, Cheryl. This is a great lifestyle. There are many ways to live it, and there’s no right or wrong way, but most folks who give it a try have an awful lot of fun! Outstanding pictures!! One of our favorite places also. God is glorious in his majesticness (is that a word)? LOL. Have fun!! Absolutely, and I’m sure majesticness is a word too, especially when used with such enthusiasm and awe! Thank you, Cinn! The rainbows were incredible, and those friendly horses were such a heartwarming surprise too.